Madonnafied kid pix. - Madonna & Me. Madonnafied: Kids Dressed up as Madonna. Send your own pix to madonna.book at gmail dot com! 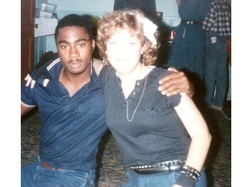 Madonna & Me contributor Shawna Kenney during her Madge phase in the '80s. 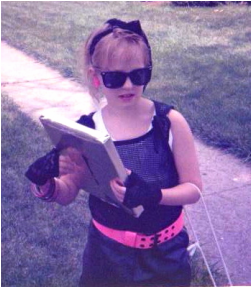 Heather Levin Greiner's nickname was "Madonna" back when this pic was taken outside Baltimore, MD. Stijn looks adorable, doesn't he? He writes, "I’m from Belgium, and back in '85 I was the only boy in my village who was a Madonna wannabe!" 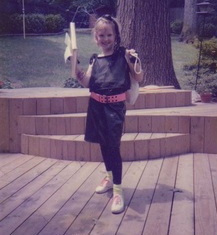 Madonna and Me editor Laura Barcella all decked out in 1985. 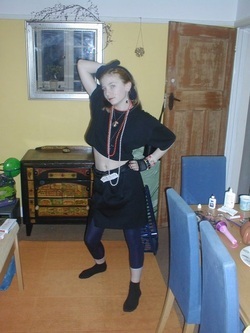 Nadia from Oxford, England "hated school so much [she] took a day off to have a 'Madonna day.'" Note the homemade BoyToy belt made out of paper. Madonna and Me contributor Kim Windyka, doing the Madonna thing at age 18. 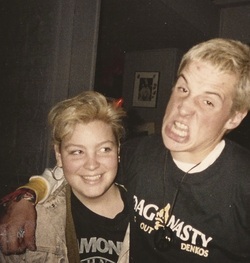 Madonna and Me contributor Shawna Kenney with friend Toby in 1987. OK, so this pic isn't 100% Madonna-fied, but Shawna's Go-Go's hair and pink acid-washed jean jacket were too good to pass up. 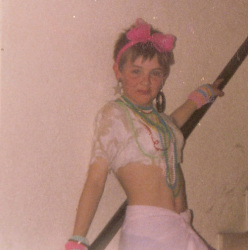 Another pic of the ever-adorable Stijn, doing his best Madonna impression in 1985.